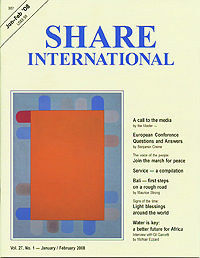 Share International covers news, events, and comments bearing on the priorities of Maitreya, the World Teacher: an adequate supply of the right food; appropriate housing for all; health care and education as universal rights; and the maintenance of ecological balance in the world. The magazine is published monthly, except bimonthly in January/February and July/August of each year. A complete translation is available in Japanese, with abridged versions appearing in Dutch, French, German, and Spanish. Periodically, Polish and Slovenian versions are published. The views expressed by authors other than Share International correspondents do not necessarily reflect those held by the editors of this magazine. By the same token, interviewees, and authors other than our own correspondents, do not necessarily subscribe to or support the information and approach which form the basis and context of this publication. View a sample in PDF format.